Recently we've seen a large increase in the sales of our popular, low-cost CID Customer Interface Devices. Solid State Instruments has been providing numerous configurations for the CIDs in order to meet individual needs. Due to the increase in demand, we've decided to consolidate and simplify the enclosure to increase flexibility of the CID for our customers. SSI is proud to announce that we've consolidated all of our CID-1 and CID-2 models into one model of each, housed in our new versatile rain-tight enclosure. Instead of having 11 different versions of enclosures for both the CID-1's and CID-2's, one universal model of each will be offered that can be modified to whichever configuration is needed. Upon installation, the installer will be able to tailor the unit for their specific needs. 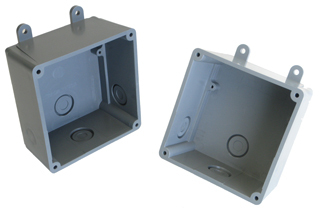 There are 4 knock-out-hole options on the enclosure that can easily be removed on-site in order to fit each unique situation. No more trying to figure out which model you need before installation. Simply knowing whether a CID-1 or CID-2 will meet your specifications is all that's needed. Once on-site, you can simply knock-out whichever holes are necessary. By simplifying our enclosures and offering a universal model, we hope to make installation even easier for our customers allowing for greater flexibility, convenience, and quicker installation time. Click here for more in-depth information about the CID-1 or CID-2.